Rainy days always make me crave the most random assortment of things. Things like pancakes, watching reruns of That 70’s Show, going swimming, and muffins. 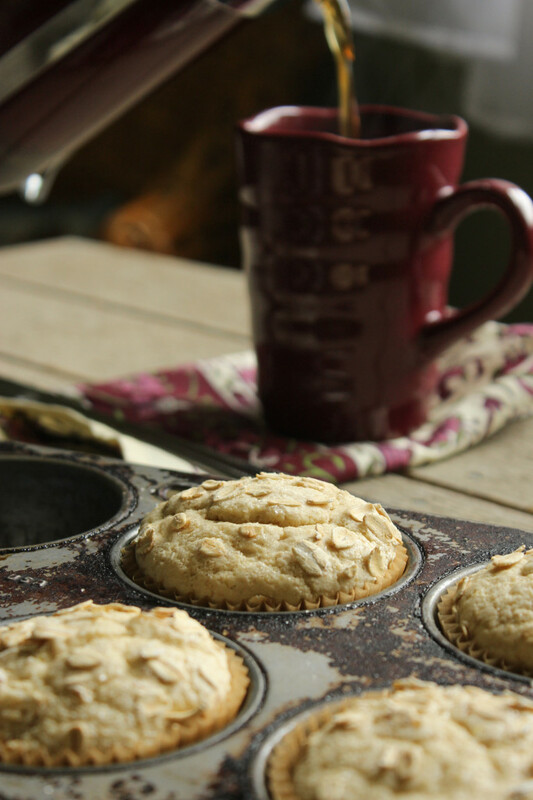 Sweet, fluffy muffins that make the whole house smell like a Sunday morning. A threat of rain hung low in the sky for most of the day yesterday, letting teases of sunshine sneak through every once in a while. Hazy, humid, and still – not exactly a make-me-want-to-get-out-of-bed type of day. Our weather has been acting a lot more like spring than summer lately. There’s an occasional scorcher, but it seems like there have been so many showers and storms. If it weren’t for the humidity, you could have almost mistaken this June for April. I was on the fence about what kind of recipe to make yesterday but it seemed like the perfect kind of day for… yup – you guessed it – baking. But then the question was “What do I want to bake?” Muffins, clearly. When I looked at our brainstorming board, nothing jumped out at me. Next stop: Pinterest. I don’t know about you all, but sometimes Pinterest is more of a curse than a blessing. I get on there to find a sangria recipe for a cookout and 2 hours later I’m an expert on oil pulling and homemade deodorant. That’s when I know it’s time to close the trusty old Macbook and seek inspiration elsewhere. This time, my eye landed on a special gluten-free cookbook that was laying on our coffee table. While shopping for camping gear at Goodwill one day, Clark and I discovered this gem and couldn’t resist the $1 price tag. It’s a gluten-free cookbook from the 90’s. Yes. Apparently, gluten-free was already a thing back then. Totally news to me. The rest of the world took a long time getting on that bandwagon, eh? Perhaps even more unbelievable is that when we started finding notes in the margins, we realized we knew the book’s former owner! She was in our high school class and she was on the high school bowling team with us. Small town things. 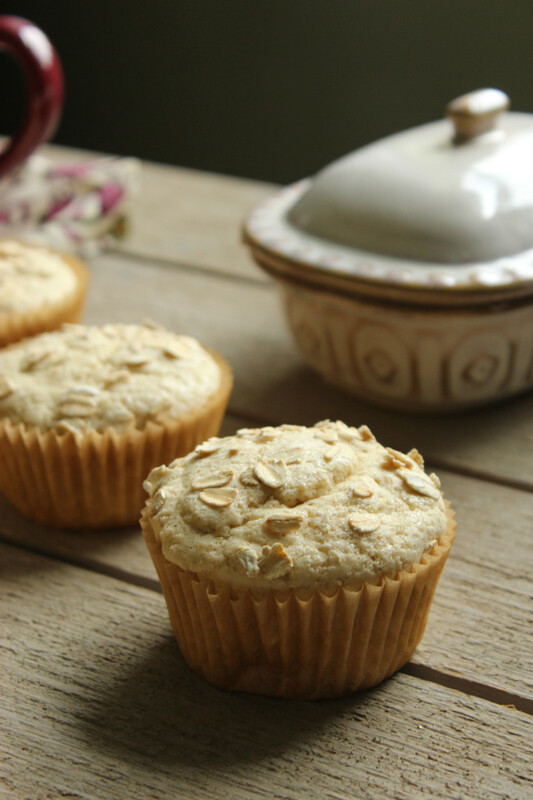 We snagged these muffins right out of the pages of The Gluten-Free Gourmet: Living Well without Wheat by Bette Hagman and only one small tweak was needed to replace shortening. 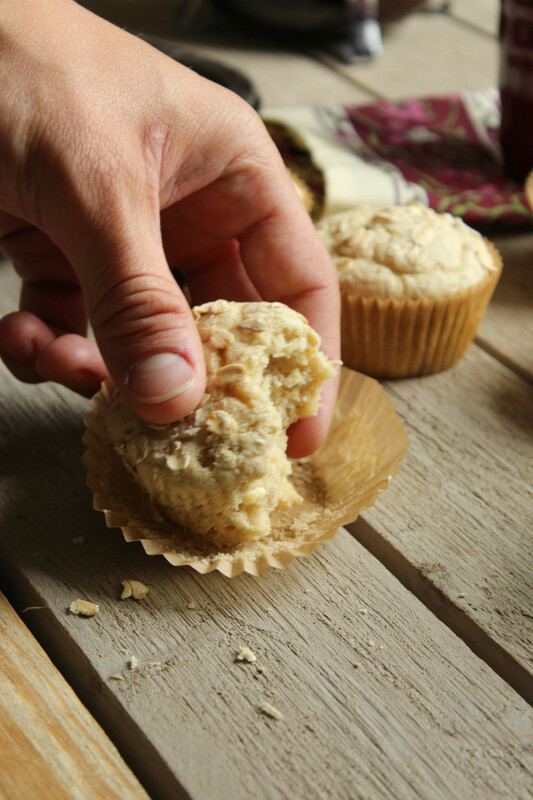 Saved from being passed up by hundreds of Goodwill shoppers or collecting dust on someone’s bookshelf, here is a recipe for some of the best darn muffins I’ve ever tasted – gluten-free or otherwise. Unlike some GF baked goods, there is nothing spongy or chewy going on here; just light, soft texture and a delicate sweet vanilla flavor. 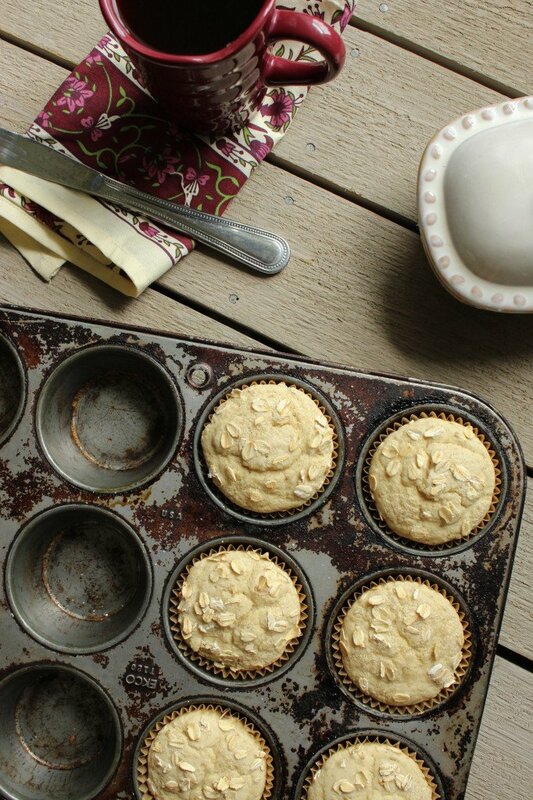 You’ll love them because they’re so simple – two bowls, mix, and into the muffin pan they go. In all, they’re made and ready to eat in 30 minutes. 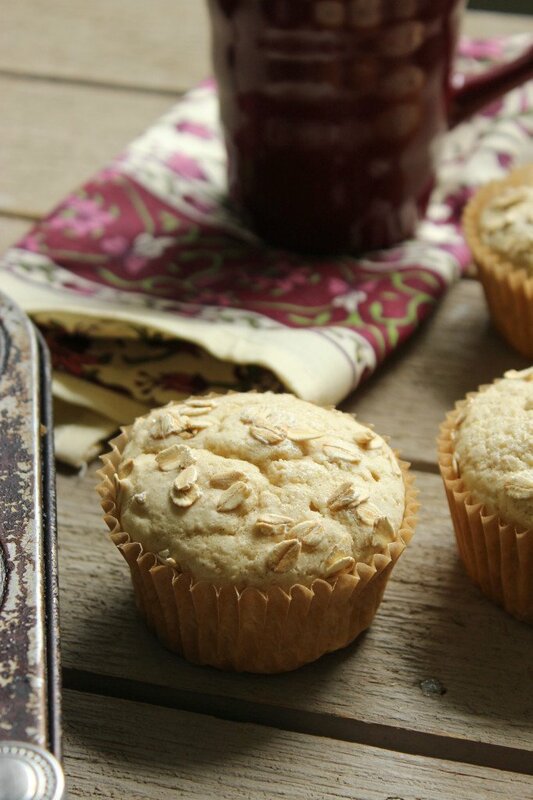 A quick, go-to option for gluten-free muffins, these come together in 30 minutes. They have a soft texture and sweet vanilla flavor. Even non-GF eaters will gobble these up! In a large mixing bowl, cream together sugar and coconut butter. Once flax eggs have set-up, lightly beat them in. In a separate bowl, mix together flour, salt, and baking powder. Slowly pour the dry mixture into the wet mixture along with the vanilla and combine. Sprinkle with rolled oats and a pinch of sugar. 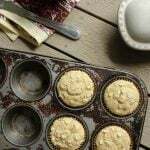 Fill 8 muffin cups 2/3 full with the batter and bake for 20 minutes. If you’re a batter taster [like me], you might notice that this batter doesn’t taste very sweet pre-baking. Have faith! When they come out of the oven, they’re just right. Sweet, but not too sweet. A good drizzle of honey or agave, or even a slather of coconut butter turn these into a treat. But as is, they’re also great for a running-out-the-door breakfast or a tasty road trip snack. If desired, you could fold in 1/3 – 1/2 cup of blueberries, raspberries, or whatever kind of berries you happen to dig. 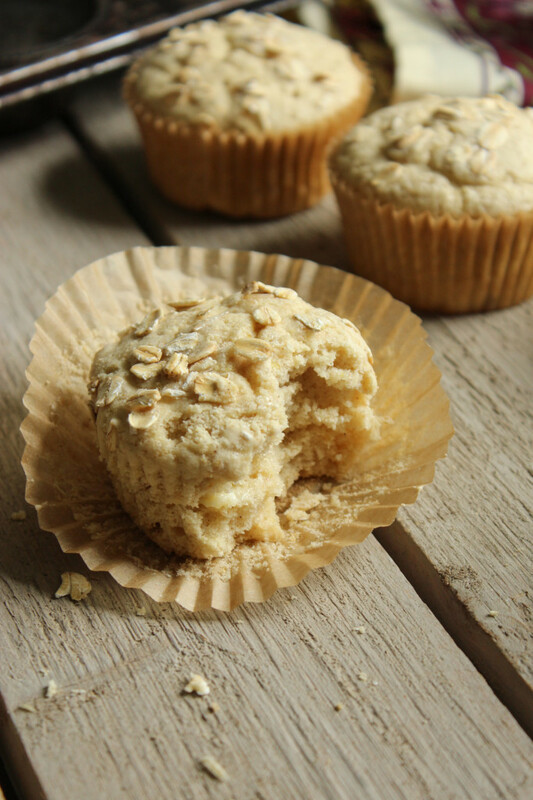 Rolled oats are not Gluten free as they are normally rolled in flour to stop them from sticking. You can buy GF oats but it might be worth stating that on the recipe. Thanks for the tip, I’ll include that in the recipe for future readers. I always buy GF oats so it slipped my mind! Hi! What brand or what goes into gluten-free flour mix for 30-MINUTE VEGAN AND GLUTEN FREE MUFFINS? Great question! We like to use Wholesome Chow’s GF flour mix. You can find it at some health food stores, or on Amazon here.